Output performance, not heat - LORD CoolTherm® custom-tailored encapsulants and gap fillers improve proper heat flow in inductors and transformers, optimizing performance during charging and increasing product longevity. Since our encapsulants have a low viscosity, they flow easily into the tiniest crevices, enabling better impregnation of irregularly-shaped magnetic components and helping to reduce inductor hum. We also offer a range of gap fillers that can provide a thermal interface between your charger’s magnetics and cooling plate. Whatever your charger application requires, we can help you select the correct material and optimize your process to improve performance and lower costs - contact us today! Our encapsulants provide a robust thermal interface between magnetics, capacitors, switching electronics and the heat sink, resulting in a more reliable product for you and your customers. Additionally, LORD encapsulants can help quiet high frequency hum. Improve Performance: We have encapsulants that facilitate optimum heat transfer because of their high thermal conductivity and low viscosity. Protect Electronics: Potting compounds provide protection from dust and moisture and can help reduce vibration. 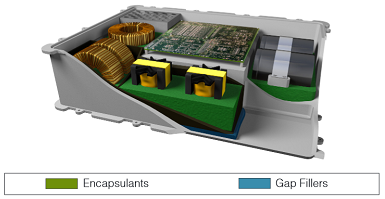 Reduce Component Stress: LORD encapsulants exhibit low shrinkage upon curing. Get the best performance out of your electronic components by filling in all of those nooks and crannies with a thermally conductive gap filler that was designed with electric vehicle applications in mind. They are a stay-in-place solution and cure as a gel, easing the stresses caused by thermal differences and flex. Low Outgas Options: We offer low ppm siloxane solutions for sensitive electronic applications. Protect Against Shock: Our gap fillers remain tacky and soft to dampen vibration.